Final two days of the qualifying. Which 16 players are going to catch a plane to Shanghai in September? 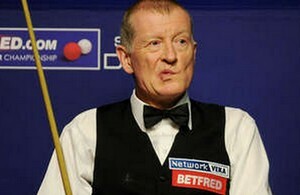 Two legends Steve Davis and Jimmy White will not show up in Shanghai because they lost in Round 3 which lost to Passakorn Suwannawat (1-5) and Nigel Bond (0-5) respectively. Bond whitwashed Marcus Campbell in the final round to book a seat to Shanghai but Suwannawat did not. He fell to Stephen Lee by 1-5. The Latest Ranking Tournament winner Stuart Bingham stormed to main draw of Shanghai Masters in September. Bingham defeated Tom Ford once again after Australian Goldfields Open, 5-1 with 111, 107, 103 and 49. Stuart surely found his confidence to win every match! Masters Quarter-finalist Mark King booked a spot in Shanghai after turnover against Liu Song. King did a great job, winning 5-4 from 1-4 down. 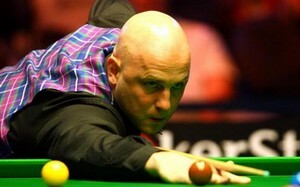 The unfortunate Chinese is not going to play in his own country but well done to Mark King! Barry Hawkins was the second ill-fated player to lose the match 4-5 from 4-2 up. Former Pink Ribbon Event Winner Michael Hot was the one who won the four-hour marathon, taking three frames in a row to complete the fine comeback. Liang Wenbo secured a chance to show his game in front of Chinese people by a fine performance 5-2 over Kurt Maflin with 81, 71, 66, 53. Ken Doherty and Matthew Selt who did an awesome job in Bendigo won't be playing in Shanghai in September. Doherty lost to Anthony Hamilton while Selt fell to Martin Gould with the same scoreline, 2-5. The other ray round former Shanghai Masters champion Dominic Dale will make his trip to China. He produced convincing victory against Jamie Burnett with 102, 68, 67, 61, 50, 49. James Wattana will also go to Shanghai with a nice 5-1 win over PTC1 runner-up Joe Perry. Jack Lisowski will be happy to play in China for the first time. Lisowki beaten Hong Kong's Marco Fu 5-1 and knocked 104, 80, 76, 55, 49 on his way.